SAN FRANCISCO ‒ As every Trekker worth his weight in Klingon plunder knows, San Francisco ‒ in the 23rd century ‒ is Starfleet Headquarters. There was a glimpse of that futuristic metropolis in 1979’s “Star Trek: The Motion Picture” and again three years later for the opening scenes of “Star Trek II: The Wrath of Khan,” when Admiral James T. Kirk went through another of his mid-life crises and had to be cajoled back to active duty by Dr. Leonard “Bones” McCoy. But the Starfleet Headquarters in those installments were optical illusions ‒ process shots done at Paramount and George Lucas’ Industrial Light & Magic (ILM) in San Rafael. 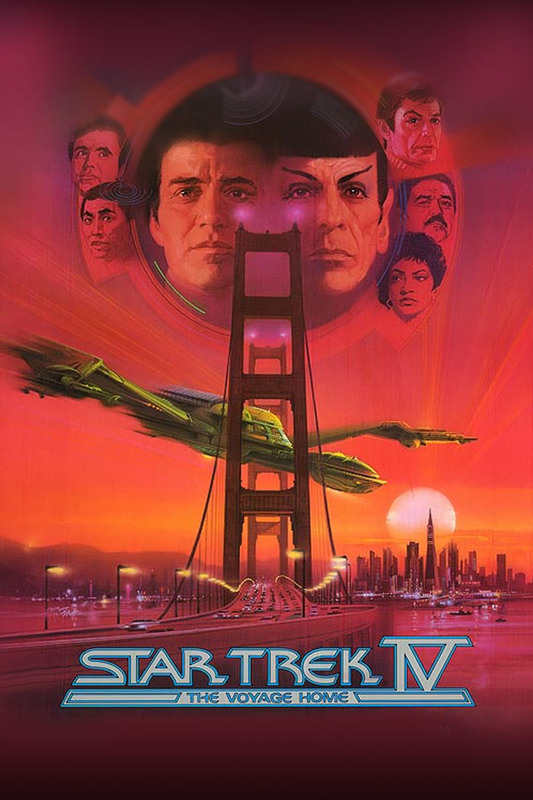 For “Star Trek IV: The Voyage Home,” which takes place in the past (our present), Paramount and director-star Leo nard Nimoy wanted real Bay Area locales. “IV,” due out this winter, has now moved on to post-production in Los Angeles and ILM. But the “Star Trek” company was in San Francisco recently, and shot sequences at the Monterey Bay Aquarium and in Sausalito as well. IT’S the last day of the shoot, and Nimoy/Mr. 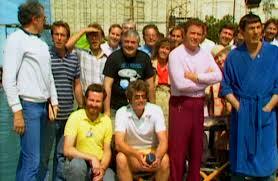 Spock has put aside his Vulcan ears and is concentrating on directing William Shatner and Catherine Hicks. They’re sitting at a table in a mock-up of a North Beach Italian restaurant, amusing themselves between takes by fencing with bread sticks. The art-deco eatery is actually located on Soundstage 2 of the San Francisco Studios, which is at the 7th Street exit off Highway 101. Plot points on the $23-million adventure are being kept like state secrets. And, all who visit are told “Shatner absolutely refuses to do any interviews.” This jibes with the how-dare-you glower received when a reporter introduced himself to Shatner on the street. Sporting a regulation-maroon Starfleet uniform, toupee and a layer of tanning makeup, the star curtly excused himself and, dodging the autograph-seekers on the corner, disappeared into his trailer to study the day’s lines. Now, sitting across from Hicks, Shatner seems bored, aloof. He’s not even attempting to hide his considerable paunch. ”Quiet on the set,” the assistant director orders. A soft, reassuring voice from somewhere behind the camera says, “OK, action.” Forty-plus extras begin making like patrons at a popular restaurant. This isn’t hard because the set has been catered by Vanessi’s in North Beach. The pasta and Chianti definitely aren’t special effects. The scene calls for Hicks (best known for TV’s “Marilyn: The Untold Story”), a marine biologist with the Sausalito Aquarium , to order dinner. Shatner responds with a line about the Earth’s whale population. This is the key to “Star Trek IV,” which comes with a strong conservationist message. “Implicitly,” Shatner’s Kirk responds with typical devil- may-care smirk. “I’ll have a large mushroom (pizza), with pepperoni and extra onions,” Hicks tells the waiter. A moment of silence. Space jockeys from the future obviously don’t know from pizza pies. “And you, sir?” the waiter asks. “Make that two,” Shatner shrugs, all the while staring into Hicks’ sparkling baby blues. “Excellent. Perfect. That’s a good one,” director Nimoy tells cinematographer Don Peterman (who also shot “Flashdance” and “Cocoon”). Nimoy and company kibitz as the crew repositions the camera for reverse angles of Shatner. The next exchange holds more clues to the new plot, said to be enthusiastically endorsed by series creator Gene Roddenberry, who again serves as executive consultant. 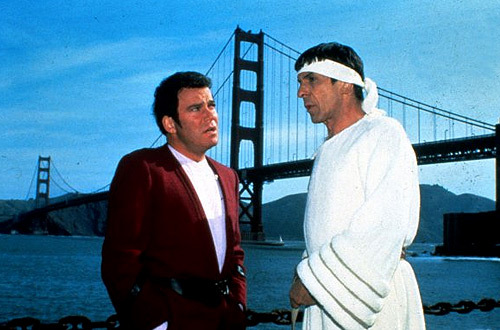 “I can take those whales somewhere ‒ where they wouldn’t be hunted,” Shatner tells the doctor. And so it goes for the rest of the afternoon. Swashbuckling, it ain’t. But that’s the point, everyone here says “Voyage Home,” in sharp contrast to the first “Star Trek” movie, will stress humor and romance and character development, not warp- speed dogfights. “Voyage Home,” various sources report, picks up where “Star Trek III: The Search for Spock” left off ‒ on the planet Vulcan, where Spock, “dead” since the closing scenes of “Star Trek II,” has his “katra” (life’s essence) restored by High Priestess T’Lar (Dame Judith Anderson). At the start of “IV,” Kirk and company are on their way home to “face what could be very serious charges” for disobeying orders. It is while in transit that Spock’s Vulcan ears detect a strange signal, warning of an immense object headed toward Earth. Said object will eventually cause a great cloud cover to block out the sun and threaten all life forms on the planet. Spock eventually cracks the coded message: It’s a whale’s song. But whales have been extinct for centuries, the victims of 20th century greed and carelessness . . . So, as they did in the celebrated “City on the Edge of Forever” episode of the TV series, Kirk and crew beam themselves back in time ‒ on a mission to save Earth from itself. The unfolding drama, we’re assured, will combine suspense, romance and lots of culture-clash comedy. The brass at Paramount is banking on another “Star Trek” bonanza. The first installment grossed a record $17 million its first week in release. Final take: $90 million. “The Wrath of Khan” picked up a tidy $31 million its first 10 days in release, making it the single highest grosser for that period in Paramount’s history. Final gross: $80 million. If adjustments are made for inflation, “The Search for Spock,” which marked the movie directorial debut of Nimoy, was, likewise, a major draw, earning $77 million in ticket sales. So a lot is riding on this “Voyage Home.” Will it be heart-tugging and extravagant enough to appeal to Trekkers and non-Trekkers? Between takes, Nimoy ‒ sans Vulcan ears ‒ talks about the “Star Trek” legacy, his excitement over the latest installment and the long road to acceptance as a bankable filmmaker who also occasionally dabbles in theater (“Six Rms Rv Vu,” “Vincent”) and airline commercials. Some have called this blackmail. Nimoy chooses to look upon it as a shrewd career move. Directing, he says, has always been his first love. Why not trade time in front of the camera for the pleasure of working behind the scenes? The ecology aspects of the new “Star Trek” came to Nimoy as he read a chilling study by Edward O. Wilson called “Biophilia” (Harvard University Press, 1984). It predicts that, if the current rate of pollution continues, the Earth stands to lose 10,000 species a year by 1990. Nimoy sought corroboration from scientists at Harvard, the Massachusetts Institute of Technology and the University of California at Santa Cruz, where he conferred with the school’s dean of natural sciences, Frank Drake.